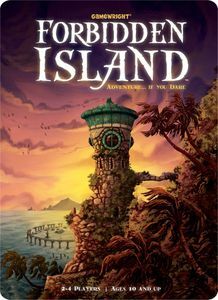 Buy Forbidden Island and PriceWatch, Buy this board game at the Lowest Price. You can your fellow adventurers have come to this island in search of mythical treasure. However the island has been cursed, so the instant your party steps foot on the island to claim the treasure it begins to sink! It's then a race against time as you move around the island, shoring up sinking areas while trying to collect the 4 treasures. Then, the entire party meets back at the helipad and gets off safely before the entire island sinks into the sea. The board is made up of 24 tiles that are laid out in a diamond pattern in random order to represent the areas of the island at the start of the game. Each tile represents a different location like the "Cliffs of Abandon" or "Tidal Palace". They remind me of a 50's era adventure, they all have really fantastic art and names. The gorgeous pictures on the tiles really helped draw me into the mindset of being on this island, and I had fun imagining my friends and I getting in and out of close calls while we tried to secure both the treasure and the island. Each tile has a corresponding card that make up what they call the flood deck. At the end of each person's turn a few cards are turned over in that deck representing which tiles need to be flooded. If the area is totally dry then it's tile is flipped over to represent that it's taking on water. If the tile is already flipped and the card comes up again then the tile sinks and is out of the game. In addition to each turn ending with flipping over flood cards, each player will also receive 2 treasure cards that have one of 4 treasure pictures on them (or a few special ability cards), for example a Chalice or Lion Statue. The goal is to get 4 matching cards, get to one of the tiles that has that treasure logo on it, and discard them to acquire the treasure. It doesn't matter which player gets them. You just need the group to have all 4 before you can leave the island. Unfortunately buried in that treasure card deck are the cards that will make your time on the island less than paradise. Hidden throughout the treasure deck are "Waters Rise" cards and when they come up a few bad things happen. First the base water level rises (this determines how many flood cards are drawn at the end of every turn), then the flood deck discards are shuffled and put back on top of the flood deck (increasing the chances that tiles already flooded will come up a second time). It's this mechanic that will stop you from keeping the flooding under control, it compounds and speeds up while you're trying to work. So you'll spend your time shoring up areas, trading cards with each other to make matching sets, and trying to decide which tiles you're going to just let sink into the deep blue. The most important tile is Fool's Landing which is the helipad off the island, if it sinks you lose immediately. You'll also need to make sure you keep a path to it alive as well since players can't move through sunken areas, so as the island vanishes you'll need to at least keep enough of the island up to have an escape route! The tension is guaranteed since even in the novice level game there's just no way to keep the island from sinking on you. While it's easy to stay ahead of flooding areas for the first couple of turns it quickly gets out of hand. It goes from having it totally under control, to letting a few areas sink to save others, to it being a mad dash to get off the island before it all sinks. It's fun to imagine thematically speaking running around this island getting the treasure and trying to survive to make it out alive. It has a very Indiana Jones-ish feel to it.